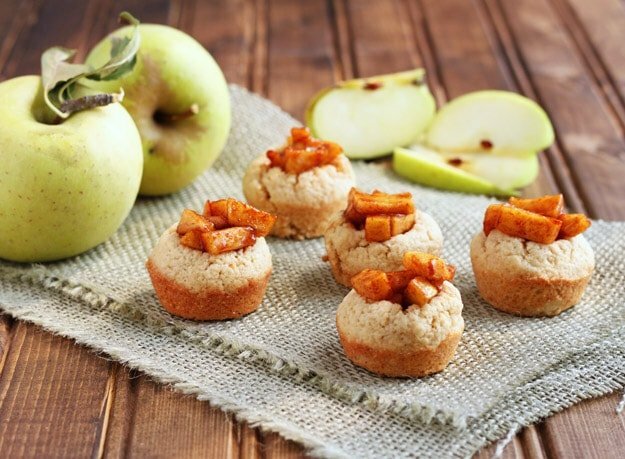 Caramel apple cookies are bite-size cookies made in a mini muffin pan filled with caramel apples. If you’re one of those people that frets about cookies spreading on the baking sheet, then baking cookie cups in mini muffin pans is for you. 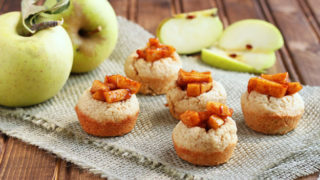 This recipe for brown sugar cookie cups filled with sweet, caramelized apple chunks is just for you! These are great to bring to a party, especially a fall themed party! I would bring my Fall Sparkling Sangria in a pitcher, and these cookie cups any day. The orange juice in the caramelized apple filling might sound weird to you, but I love the way the orange juice brings the acidity that doesn’t compete with the apple flavor. Sometimes, when we cook with lemon juice, it overwhelms all of the other flavors. Orange juice is a great way to use gentle acidity to soften and bring out the apple flavors. This recipe makes 12 caramel apple cookies, which is slightly more than 2 people need, but they’re so tiny! I feel like you can enjoy more than one cookie at a time with this recipe. The best apples to use for these caramel apple cookies is Honeycrisp apples, in my opinion. I’ve made it with the Granny Smith apples from my CSA box, but the Honeycrisp apple has the perfect balance of flavors. Somehow, a Honeycrisp apple manages to be sweet and tart at the same time. Plus, the crispness is perfect–they soften in the skillet, but do not turn mushy. You only need 1 medium apple for this recipe, though, so feel free to try it with a different apple each time. The apples in the photo are an heirloom variety that is similar to a Granny Smith. I hope you make these caramel apple cookies, and report back to me how much you love them. Caramel apple cookies filled with caramelized apple chunks. Brown sugar cookie cups full of apples. Preheat the oven to 350 and grease 12 cups on a mini muffin pan. In a medium bowl, beat together with an electric mixer the butter, brown sugar, egg and vanilla. Beat until fluffy. Next, add the flour, baking powder and salt and beat until just combined (do not overmix). Scoop a heaping tablespoon of the dough and roll it into balls in your hand. Drop each ball into the muffin cups. Bake for 9-11 minutes, until the cups are domed. The edges should not be too golden brown. Meanwhile, saute the diced apple in the butter, sugar, cinnamon and orange juice until tender, about 5 minutes. Set aside. Immediately after the cookies are done baking, press the handle of a wooden spoon into each muffin cup to create a divot. Press it down about 1/2" and wiggle it to make the hole larger. Scoop the apple mixture into each cookie cup. what a lovely idea and such a sweet addition! These are so cute and fun and perfect for a fall baby shower! What a sweet baby shower! These look wonderful. Amazing cookies and a wonderful treat to bring to the baby shower! !! These look incredible. Seeeeriously amazing. These are such gorgeous fall treats! What a wonderful way to celebrate the impending arrival of a little one. Thank you for sharing with me. Now to buy a pound of apples! Ooooh these are so lovely!! Thank you so much, Christina… You’re too sweet! I am still speechless from all of the surprise blog posts today. I am lucky to have so many amazing friends! These Caramel Apple Cookie Cups look absolutely fabulous, and I can’t wait to try them… I know they will be a big hit this fall with friends and family. Yum!! Been making my way around the food table at this virtual shower this morning. Jen and Darron are going to love it all and you are all so thoughtful to put this together for them. Time to grab one of these wonderful cookie cups…I know they will disappear quickly! These look absolutely amazing!! how adorable. These are adorable! Perfect for a fall baby shower! Drooling over how yummy these look!!! Happy baby shower Jen! These are so cute! I love anything mini for a baby shower, and these are perfect for a fall baby. Awwww, these are just too cute! And you guys are so sweet for doing this for Jen! Whoa! Those look so delicious! These are adorable, such a great shower treat! These are so cute, Christina!! Congrats to Jen and what a sweetie you are for doing this! Christina, thank you so much for joining us in the shower! I truly love these little cookie cups. Caramel Apple anything is right up my alley, but I can just imagine loading up my plate with these little beauties! yummy, these look so delicious and perfect for fall. Those cookie cups are just adorable! I see these becoming a favorite very fast!